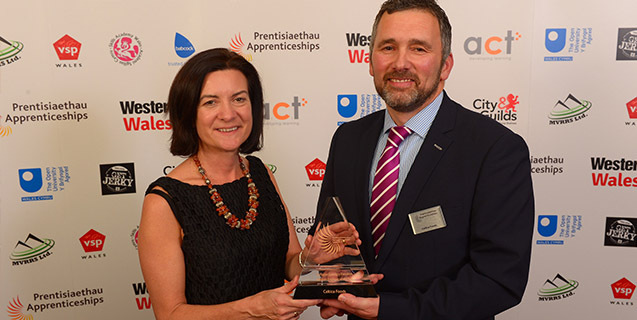 A catering butchery and meat processing company, which has established a training academy to grow its own skilled workers, has been named Wales’ Medium Employer of the Year. Celtica Foods, a division of Welsh independent food service wholesaler Castell Howell Foods based in Cross Hands, near Llanelli, collected the coveted award at the prestigious Apprenticeship Awards Cymru held at the Celtic Manor Resort, Newport on November 9. Managing director Edward Morgan said: “We are very proud to win this award for the food sector in Wales, which is a priority sector for the Welsh Government and employs a large percentage of the nation’s workforce. He also congratulated the other finalists in the category – Mainetti UK and Inspiration Lifestyle Services – saying it was great to see two Carmarthenshire companies in the final. Jointly organised by the Welsh Government and the National Training Federation for Wales (NTfW), the coveted awards are supported by media partner, Media Wales. Driven by an ambition to be the best in its sector, Celtica Foods has trained 45 apprentices over the past four years and currently has 17 on its books. The company, which has a workforce of 75, supplies meat to independent pubs and restaurants, hospitality groups, contract caterers, hospitals and schools. A training academy was developed with support from Cambrian Training Company to attract more young people into the meat sector and upskill the entire workforce. Programmes ranging from Foundation Apprenticeships to Higher Apprenticeships in Meat and Poultry Industry Skills, Food Industry Skills and Food Manufacturing Excellence are delivered. Training programmes are tailored to meet the specific needs of Celtica Foods and its customers. “We need a diverse range of skills, from de-boning of carcase meats, producing burgers and sausages to fine cutting skills that meet our customers’ specification,” said Edward Morgan, Celtica Foods’ managing director. “Training and staff retention are important. Staff wellbeing is a priority for the company who offer confidential counselling and an occupational health therapist to workers challenged with a range of issues. Celtica Foods has a Food Standards Agency licenced cutting plant, is Grade ‘A’ accredited by the British Retail Consortium, PGI accredited and has achieved the IS01400 and ISO1900 environmental and quality standards. Minister for Welsh Language and Lifelong Learning, Eluned Morgan, who presented the award to Celtica Foods, said: “I think it is terrific the work that the company has done at Cross Hands and the impact they have made in encouraging apprentices to not just embrace an Apprenticeship but to climb up through the ranks. “This is a sector that has, in the past, depended on recruiting a lot of people from outside of Wales, but now an increasing number of Welsh people are being employed. Celtica Foods’ managing director Edward Morgan receives the award from Minister for Welsh Language and Lifelong Learning, Eluned Morgan.